Cauliflower cheese and potato pie. 1) Fry the onions in the butter in a large pan, then add the potatoes and cauliflower. Cover with salted water and boil until tender. Meanwhile pre-heat the oven to 180C/350F/gas mark 4. 2) Drain and mash the cooked vegetables, then add the mustard. While the mixture is still hot stir in most of the cheese to melt it, keeping a little cheese to sprinkle on the top of the pie. 3) Beat in the egg with the milk, then season. 4) Transfer the mixture to an ovenproof dish, then rough the top with a fork. Sprinkle the rest of the cheese over the top. 5) Bake until the top is brown and crispy. Jerusalem Artichoke and Kale Gratin. Heat oven to 190C/375F/gas mark 5 and lightly butter a gratin dish. Bring a pan of water to the boil, salt it and and then add the kale leaves. Cook for two to three minutes until just tender then drain in a colander. Heat the oil and butter in a frying pan, add the onions and garlic, and cook gently until soft and starting to take on a little colour. Add the artichokes and thyme, season generously and cook, tossing occasionally, for five minutes. Add the cream and stock and simmer gently, stirring once or twice until the liquid has reduced a little. Squeeze any excess water from the kale and chop roughly. Stir into the artichoke mixture, then transfer to the gratin dish. Mix together all the topping ingredients, sprinkle over the gratin and bake for 25-30 minutes until golden and bubbling. Take to the table and enjoy it. 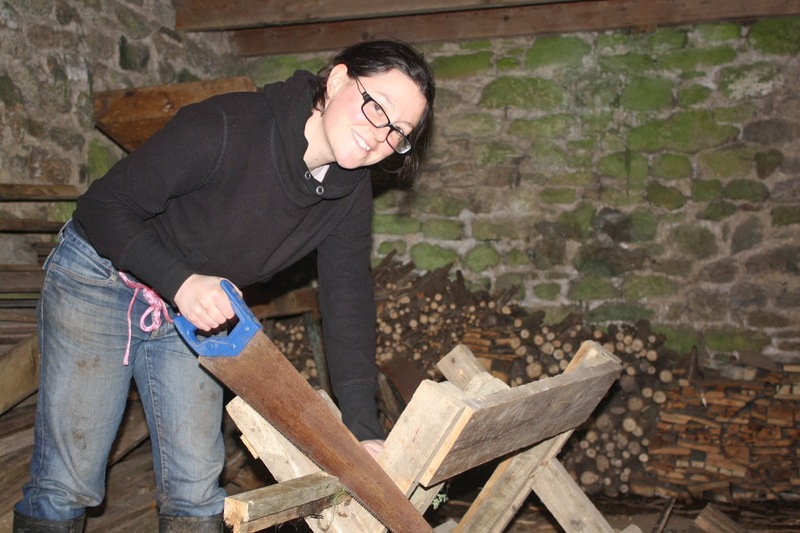 We would like to thank Wei for her recent help as a Wwoofer on the farm - she came down from London to volunteer for two days (every little helps!). 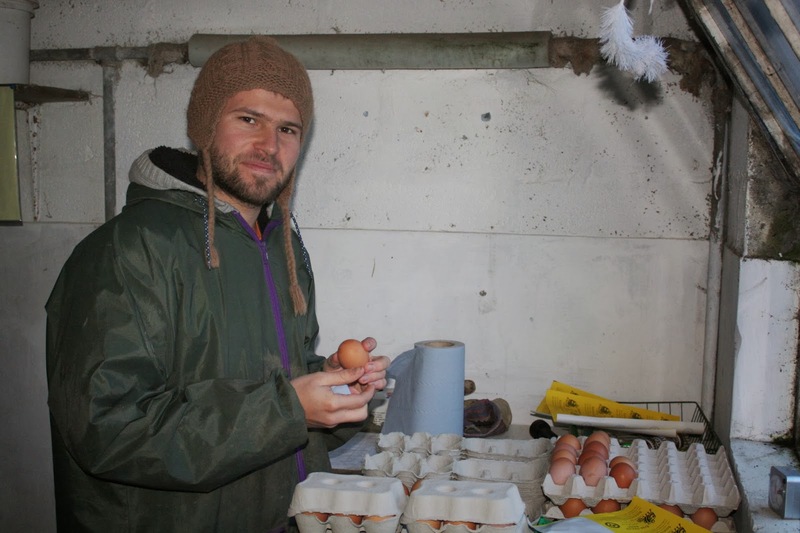 Many thanks to Adrien for helping on the farm as a wwoof volunteer for 2 weeks - we wish you a safe journey back to Paris. Adrien removing volunteer potatoes from the maincrop field. 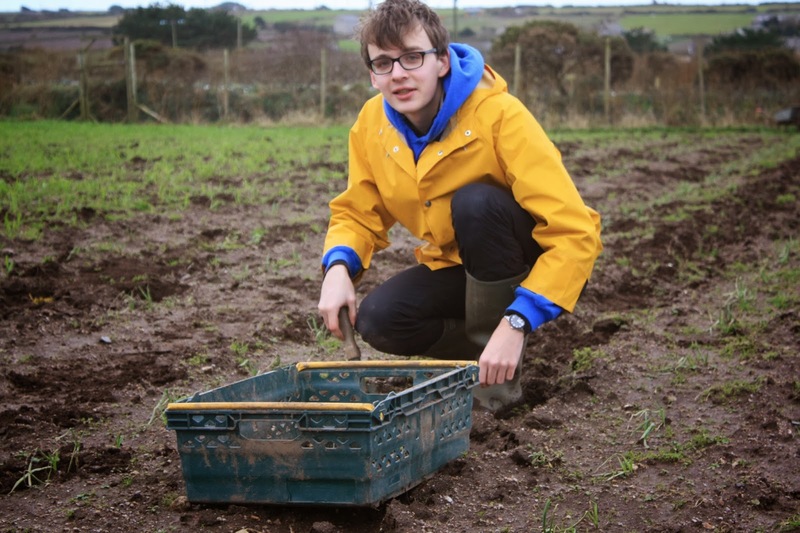 Many thanks to Pierre, the farm's last wwoofer of 2013 and first wwoofer of 2014, who left today after 10 days helping on the farm. Bon voyage, and best wishes back at work in Paris! Pierre sorting and boxing eggs.